It was lovely to see so many at our first meeting, we’re really looking forward to get working on some of the ideas mentioned. 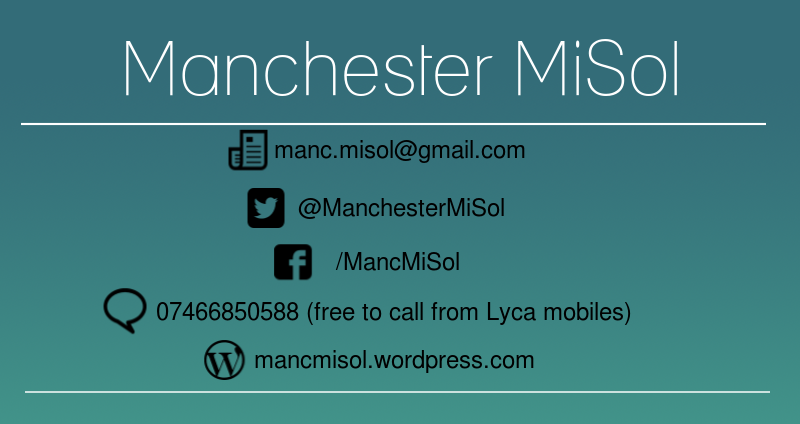 If you would like a copy of the notes, please send an e-mail to manc.misol (at) gmail.com. If you would also like to be added to the mailing list to be informed of upcoming meetings and events, please indicate in the e-mail. Our next meeting will be on Tuesday 17th June at 2pm at Sacred Trinity Church. We now have our safe spaces agreement on our website, please find it under ‘About Us’. If there is anything we have missed, please feel free to suggest additions. Next Calling all Manchester students (or others moving around this summer)!